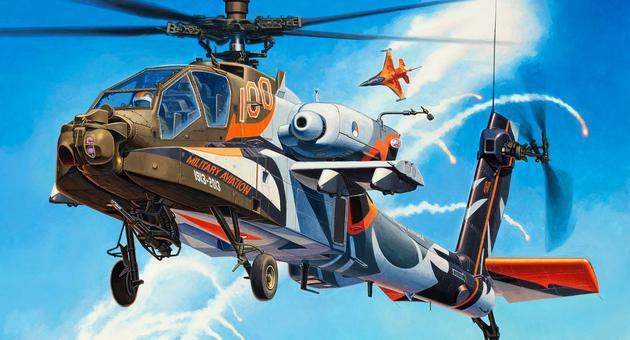 The AH-64D Apache Longbow is currently the most versatile, advanced and heavily armed attack helicopter in the world. The Royal Dutch Air Force (Koninklijke Luchtmacht / KLU) also operates twenty-nine AH-64D without however the Longbow radar. In 2013 the Royal Dutch Air Force had one of its AH-64D Longbow Apaches decorated in a very attractive colour scheme for the occasion of the KLU centenary. The helicopter carrying the number Q-17 received a colour scheme in shades of orange, gray and black to represent the Netherlands at air shows. During air shows the Royal Dutch Air Force aerobatic team pilots demonstrate spectacular loops, rolls and spins – manoeuvres that are normally unusual for helicopters. The emblem of the 301st Squadron stationed in Gilze-Rijen, home of the Apache Solo Display Team, also shows an arrow drawn in the Centaurs Longbow.